Recent investigations have shown that autoantibodies against citrullinated vimentin isolated from RA patients induced bone resorption by osteoclasts in a cell culture assay (more details in our blog post summarizing the research article by U. Harre et al.). Hanna van Steenbergen and colleagues analyzed the radiographic progression in RA patients stratified for ACPA and/or RF positivity. They show that the presence of ACPA is associated with a more pronounced progression of structural damage when scoring conventional radiographs by the standardized Sharp–van der Heijde method. These findings confirm the relevance of ACPA in bone erosions and correspond to the high-resolution micro-CT data of Hecht et al. In contrast to Hecht et al, van Steenbergen and her coworkers found no significant additive effect of RF and ACPA on radiographic progression. Limitations of conventional radiographs compared with high-resolution CT may explain this observation. Micro-CT technique has a resolution of about 100 µm and detects very small lesions with a volume of less than 1 mm³. Due to lower resolution and the limited 2D-representation, a substantial number of smaller erosions may escape the detection by conventional radiography,  but may be visible on 3-D reconstruction images of micro-CT scans. What is the appropriate detection method for RF? Conventional semi-quantitative methods for the measurement of RF-IgM depend upon the agglutination of particles (e.g. latex, sheep erythrocytes) coated with human or animal IgG. The latex agglutination test is very sensitive, but it can result in a fairly high number of false positives. Nonspecific agglutination of latex particles by sera from normal individuals is not uncommon. Immunoassays and nephelometry/turbidimetry are quantitative serological tests with the advantage of objective instrument measurement. 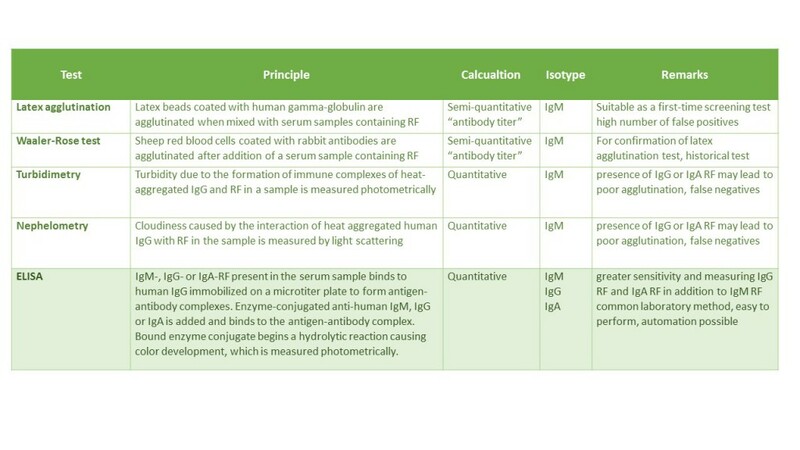 The table below gives an overview of the different established detection methods for RF. RF is more than a mere indicator for RA. 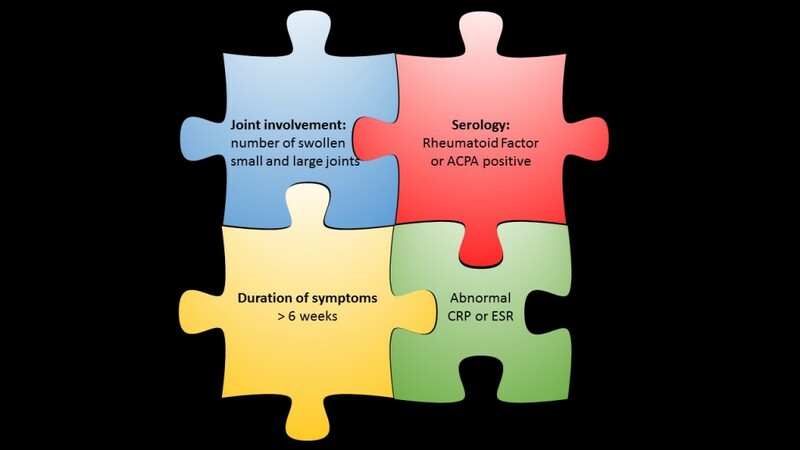 Depending on the respective isotype, rheumatoid factors contribute to disease development, to the formation of extraarticular manifestations, and support the pathogenic process in the joint. 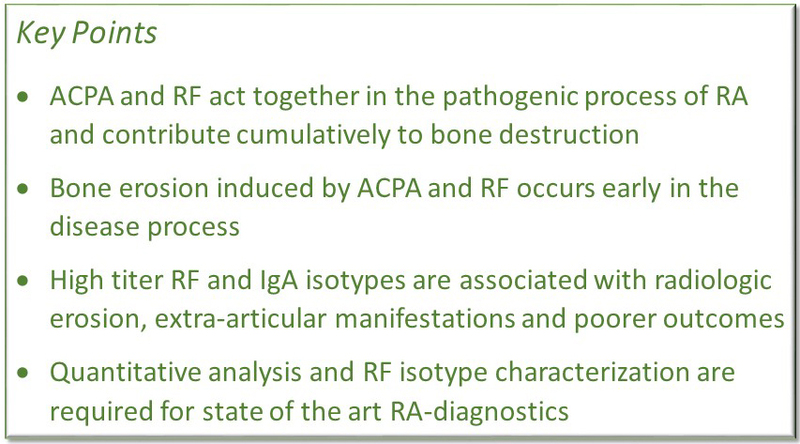 Consequently, quantification and in-depth analysis of RF isotypes is required for improved RA diagnostics.